The Mississippi Blues Commission announced that it will honor the legacy of the blues in Pensacola by dedicating it as an official stop on the Mississippi Blues Trail. The dedication of the marker will take place in historic Belmont-Devilliers on Friday, Jan. 18, 2019. An early center for blues, ragtime, vaudeville and jazz activity, Belmont-Devilliers developed into a regional cornerstone as the “chitlin’ circuit.” Touring acts and local musicians found a welcome base in the African American business and entertainment district for several decades. Blues performers such as B.B. King, Junior Parker, and Sam Cooke found a welcomed home in the neighborhood’s theaters and clubs. The marker will also recognize the works of those in the neighborhood dedicated to fostering the growth and appreciation of the Blues including Gussie Streeter of Gussie’s Record Shop and Abe Pierce Sr., of Abe’s 506 and Savoy Ballroom. The Pensacola marker, Marker No. 203, will be the second marker recognized in Florida. 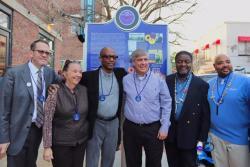 The Pensacola Blues Marker will be located at the corner of Belmont and Devilliers street at Five Sisters’ Blues Café, the former site of Gussie’s Record Shop and the historic African-American business entertainment district. The entire Mississippi Blues Trail is self-guided and available at msbluestrail.org/blues_marker_list. To learn more about Belmont-Devilliers and the Chitlin’ Circuit in Pensacola, visit https://bit.ly/2smKN0I.